This book has a great discussion of the Great Day of God’s Wrath! Be sure to read the previous three installments (beginning here) in this series in which we examine the use of the term and motif of the Great Day of God’s Wrath in the book of Revelation. An analysis of that term shows that there was but one Great Day under consideration, and that it would occur at the end of the Millennium. However, contra all futurist eschatologies, the Apocalypse also shows, very clearly, that the end of the Millennium was near when John wrote, and would occur at the judgment of Old Covenant Jerusalem in AD 70. Then I saw another angel flying in the midst of heaven, having the everlasting gospel to preach to those who dwell on the earth—to every nation, tribe, tongue, and people— saying with a loud voice, “Fear God and give glory to Him, for the hour of His judgment has come; and worship Him who made heaven and earth, the sea and springs of water.”8 And another angel followed, saying, “Babylon is fallen, is fallen, that great city, because she has made all nations drink of the wine of the wrath of her fornication.” Then a third angel followed them, saying with a loud voice, “If anyone worships the beast and his image, and receives his mark on his forehead or on his hand, he himself shall also drink of the wine of the wrath of God, which is poured out full strength into the cup of His indignation. He shall be tormented with fire and brimstone in the presence of the holy angels and in the presence of the Lamb. And the smoke of their torment ascends forever and ever; and they have no rest day or night, who worship the beast and his image, and whoever receives the mark of his name.” Here is the patience of the saints; here are those who keep the commandments of God and the faith of Jesus. Then I heard a voice from heaven saying to me, “Write: ‘Blessed are the dead who die in the Lord from now on.’ ” “Yes,” says the Spirit, “that they may rest from their labors, and their works follow them.” Then I looked, and behold, a white cloud, and on the cloud sat One like the Son of Man, having on His head a golden crown, and in His hand a sharp sickle. And another angel came out of the temple, crying with a loud voice to Him who sat on the cloud, “Thrust in Your sickle and reap, for the time has come [e]for You to reap, for the harvest of the earth is ripe.” So He who sat on the cloud thrust in His sickle on the earth, and the earth was reaped. Then another angel came out of the temple which is in heaven, he also having a sharp sickle. And another angel came out from the altar, who had power over fire, and he cried with a loud cry to him who had the sharp sickle, saying, “Thrust in your sharp sickle and gather the clusters of the vine of the earth, for her grapes are fully ripe.” So the angel thrust his sickle into the earth and gathered the vine of the earth, and threw it into the great winepress of the wrath of God. Like Revelation 11, it would take an great deal of time to fully develop and exegete this text, but, there are several outstanding motifs and tenets that allow to get a handle on the context, the time and the framework for its fulfillment. Take note that the text is about the impending judgment of Babylon: “The hour of her judgment has come!” We have already demonstrated that this is the city “Where the Lord was crucified” in chapter 11 and that can be no other than Old Covenant Jerusalem. That judgment of Babylon was coming very soon: “Then I saw another angel flying in the midst of heaven, having the everlasting gospel to preach to those who dwell on the earth—to every nation, tribe, tongue, and people saying with a loud voice, “Fear God and give glory to Him, for the hour of His judgment has come.” (Revelation 14:6-7). Needless to say, any application of this to Rome, whose destruction was not at hand, not coming soon, whose judgment had not come, is specious. And applications to literal Babylon, New York City, America or any other entity, whose judgment was not at hand when Revelation was written should be rejected. I am personally convinced the 1 Peter was written after Revelation. This is supported by the language of 1 Peter 4:17. In Revelation the judgment of Babylon was coming soon. In Babylon– from which Peter was writing (1 Peter 5:14) the (divinely appointed time) for “the judgment” had arrived.” In Revelation, the theme of martyr vindication, and the filling up of the measure of suffering permeates the book, in 1 the apostle writes of the church was filling up the measure of her suffering (1 Peter 5:10). 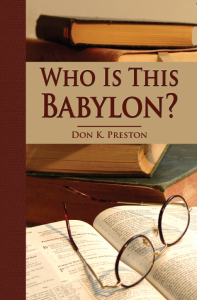 Judgment was coming on Babylon for persecuting the saints, the apostles and prophets of the Lord. In 1 Peter, the apostle reminds his audience that he, and apostle of Jesus, was a partaker of “the sufferings of Christ” (1 Peter 5:1-2). In Revelation 6, the martyrs under the altar were told that they only had to wait for “a little while” until the Great Day of God’s Wrath for their vindication and the judgment of their persecutors. Likewise, in 1 Peter 1 the apostle spoke of the suffering of those Asian saints (just as the letters of Revelation were to the churches of Asia being persecuted) and promised them that they would only have to suffer a little while. In addition to these parallels, in Revelation 14, we find the preaching of the Gospel, the Gospel of the impending destruction of Babylon to all nations, tribes and tongues. In Matthew 24, in discussing the impending fall of Jerusalem, Jesus said: Matthew 24:14– “This Gospel of the kingdom must be preached into all the world, as a witness to the nations, then comes the end.” Be sure to check out my brand new Kindle E-Book, entitled The Gospel (?) of Destruction for an important and indepth discussion of this fascinating text. In Matthew 24, we find the time of the harvest at the sounding of the Great Trumpet– and this is nothing other than the resurrection. In Revelation 14 we have the proclamation of the impending harvest which is nothing other than the resurrection. In the Olivet Discourse we find Jesus saying that “this gospel of the kingdom” the message of the impending end of the Old Covenant age and the destruction of the city and temple would be preached into all the world as a witness to the nations. The judgment of the persecuting city would take place in that generation at the coming of the Lord in power and great glory. In Revelation 14, we find the preaching of the Gospel to every nation, tongue and tribe, with the message that the hour of Judgment on Babylon (the city where the Lord was crucified” was near. The Great Day of God’s Wrath on the persecuting city was at hand. When we couple all of these direct parallels with the reality that the Great Day of God’s Wrath in Revelation 14 is the very same Great Day of God’s Wrath in Revelation 6, and, the Great Day of God’s Wrath in Revelation 20, at the end of the Millennium, it becomes more than evident that the end of the Millennium was in the first century. 1. Two totally distinct and disparate Great Day’s of the Lord’s Wrath. One “in time” the other to end time” even though the precise language is used to describe “both” of those Days. 2. Two totally distinct and disparate Great Day’s of the Lord’s Wrath to be proclaimed as “this gospel of the kingdom” warning of its impending fulfillment. 3. Two totally distinct and disparate Great Day’s of the Lord’s Wrath for the vindication of the martyrs. 4. Two totally distinct and disparate Great Day’s of the Lord’s Wrath for the vindication specifically of the apostles and prophets of Jesus. After all, Jesus posited the AD 70 judgment on Jerusalem as the time when his apostles and prophets would be vindicated and glorified, and Revelation posits the impending judgment of Babylon as the time of the vindication of the apostles and prophets of Jesus (18:20-24). 5. Two totally distinct and disparate Great Day’s of the Lord’s Wrath, one Day that was imminent, coming soon, but the other that was not at hand, was not coming quickly, was not to be fulfilled shortly from the time of John. But of course, in the book of Revelation, as we are showing, there is no such temporal distinction between an at hand Day of the Lord’s Wrath and a not at hand Day. Our analysis of the Great Day of the Lord’s Wrath has shown conclusively that there is but one Great Day of the Lord’s Wrath in Revelation. Thus, the reality that the Great Day’s of the Lord’s Wrath would occur at the end of the Millennium, and the very clear, unbroken testimony that the Great Day of the Lord’s Wrath was to be the time of God’s judgment of Old Covenant Jerusalem, the Great Persecutor of God’s people, in AD 70, demands that the end of the Millennium was in the first century. This will be confirmed even more firmly as we continue this series, so stay tuned. 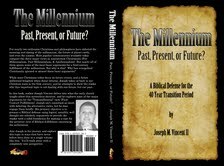 In the meantime, be sure to order a copy of Joseph Vincent’s excellent book, The Millennium, Past, Present or Future. You will be amazed at the wealth of information that he adduces to prove that the Millennium was in fact ended in AD 70. Stay tuned for more as we continue our examination of the Great Day of God’s Wrath and the End of the Millennium. This book has an oustanding discussion of the end of the Millennium in the first century.